It's finally here! after much speculation and peoples lust for a cordless version of the extremely popular TS55 + TS55R the TSC55 has now been released and is available to order here. "Based on the TS 55 R, the new TSC 55 cordless plunge-cut saw offers the same high level of performance, power and precision as the corded version." Chip collection bag for dust free working with a dust extractor. The spring loaded guide wedge runs in front of the blade to prevent it from seizing and makes it easier to position the blade in existing grooves. The TSC55 can also be fitted with a splinter guard for splinter free cuts on both sides or a viewing window for a perfect view of the scribe mark, depending on the application. 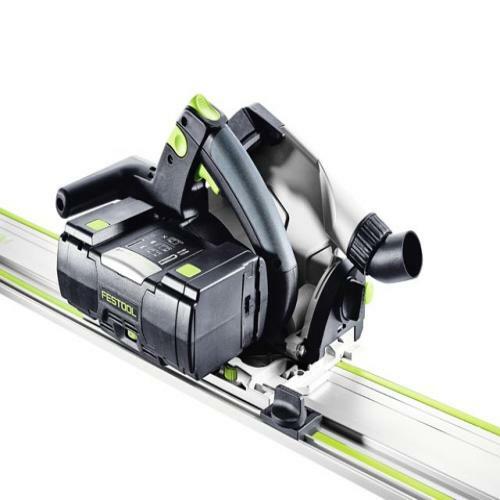 The TS55's batteries are compatible with all Festool cordless machines in the same voltage class. The machine is of course eligible for service all inclusive.